I got inked last night. Marked for life. Buzzed by the needle. Had my skin pounded. Got carved. I'd read a bunch from people who have tattoos, their designs, tips about when to get one (as in making your OWN design, and WAITING to make sure you still LIKE the design a year later), and about who are the good artists in the area. And to never get any one's name put on you unless it is your child's name. Last Saturday I made the appointment, put down the deposit, dropped off the design... My daughter was there with me, and she had "inked" me on my arms earlier that day with designs of her own, using markers (thankfully not Sharpies -- not that she didn't try). And yesterday was the day. I didn't sleep very well... Probably just the anticipation. It's a day that had been a year in the building. My design is a combination of two symbols that speak to various aspects of my life, beliefs, etc. The main part is a Thor's Hammer design, but inverted to a T-shape (most Thor's Hammers are shown with the cap of the T at the bottom). My last name starts with a T. And I'm Norwegian (3/4 anyway). Inside that, at the junction of the cap and post, is a blade triskele. Why this? 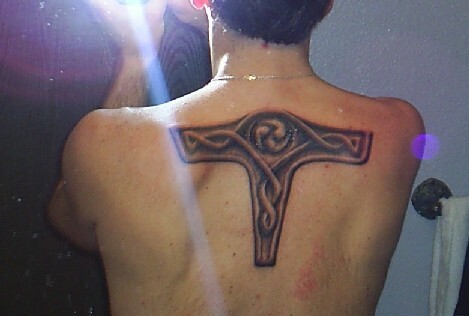 It's a Celtic design symbolic of the trinity. Three phases of life, three forms of matter (liquid, solid, and gas), three sports as one in triathlon, and the three aspects of God (Father, Son, and Holy Spirit). Three is a common motif in Celtic knot work, but the blade triskele denotes the aggressive expression -- a warrior for the trinity. So my design pays homage to my family, my heritage, my sport, and my beliefs. I made this design over a year ago, had it printed out full size, and have kept it out since. I still like it. It still means as much to me today as when I first made it. So now it's part of me. Mike Horton at The Tattoo Machine did a great job. After getting the initial outline on, we talked a little bit about how I wanted it to look, and though it took longer than initally bid, the end result is better than the piece of paper I handed him. Did it hurt? Sure. But it was bearable. And this morning it feels mostly like I just got a bad sunburn there. My wife has said tattoos are very addicting. She's kicked around ideas to add to the ones she has now. I have no plans for more at this point. I'll at least wait until the pain is forgotten and this one heals completely. I've had ideas for others, but nothing has really stuck. I'm just waiting for the day my mother sees it for the first time.